The steps to take in shrinking your building’s energy consumption and carbon footprint. Energy projects in church buildings. Commissioning an energy study of the opportunities in your building. The SW Dioceses’ scheme providing loans for renewables. Energy consumption for heating and lighting is the main source of carbon emissions in churches, halls, offices, schools and clergy housing. Energy costs are already high. Energy prices are expected to continue to be volatile and increase substantially in the future as demand for oil outstrips supply. Appoint an energy or carbon ‘tsar’. Read your meters regularly, and understand how you use energy day-by-day and year-by-year. Begin a routine of energy saving. Undertake an energy efficiency project. Take advantage of the green energy deal, available for church buildings and households. Undertake a renewable energy project. Take another look at your footprint and start again. An energy study could cover general opportunities for energy efficiency and renewable generation in your buildings, or a more specific area such as photovoltaics on the church roof. The Dioceses can recommend consultancies who have track records in undertaking such energy audits. The cost of a study is typically around £400. The consultancy would undertake a site visit. Depending on the focus for the study, the parish may need to provide certain information in advance of the visit, e.g. energy usage, boiler size. The outcome of the study would be a report, which will typically make a number of recommendations for energy efficiency and renewable generation. These might be relevant to the short term or long term, and of varying complexity and cost. Some recommendations could be implemented quickly at minimal cost; others may require a substantial project. The EU provides funding for up to 12 hours of business support, channelled through consultancies and universities. We may be able to help put you in touch with one of these. Please see the separate page for more information about energy efficiency and renewable technologies. We advise that you seek at least two quotations from different suppliers for any proposed heating or energy efficiency measures, or installation of renewable technologies. We recommend speaking to their previous clients. For example, you may like to get in touch with some of our case studies. The Carbon Trust maintains a Green Business Directory, targeted at businesses and the public sector. YouGen has a database of suppliers, installers, consultants and architects, and enables customers to rate them. The site is targeted at households, but many of the companies also work in other buildings. We also suggest contacting your Diocese, which may have negotiated deals with installers offering economies of scale. The loans for renewables below are tied to particular installers. Note that in order to qualify for the Feed-in Tariffs and Renewable Heat Incentive, and many grants, both the installer and the installed technology must be accredited under the Microgeneration Certification Scheme. Liability depends on e.g. whether the building is listed or not, or whether you are undertaking a replacement or alteration. Your Diocese should be able to provide guidance, and HM Revenue and Customs run a VAT Helpline. EcoChurch Southwest provides low-cost loans to support churches in fitting solar photovoltaic (PV) panels to the roofs of their buildings. Please contact us for more information, or if you are interested in pursuing this action. There are more ideas for funding sources, and information about crowdfunding in the Resources section. We suggest that you consult as widely as possible, including the congregation and local community, and English Heritage, National Park Authority, National Amenity Societies, etc as relevant. A faculty would be needed for any type of renewables installation, and possibly for energy efficiency work. Planning Permission may also be needed, as churches are not exempt where alterations or additions to the exterior of the church building or churchyard are proposed. 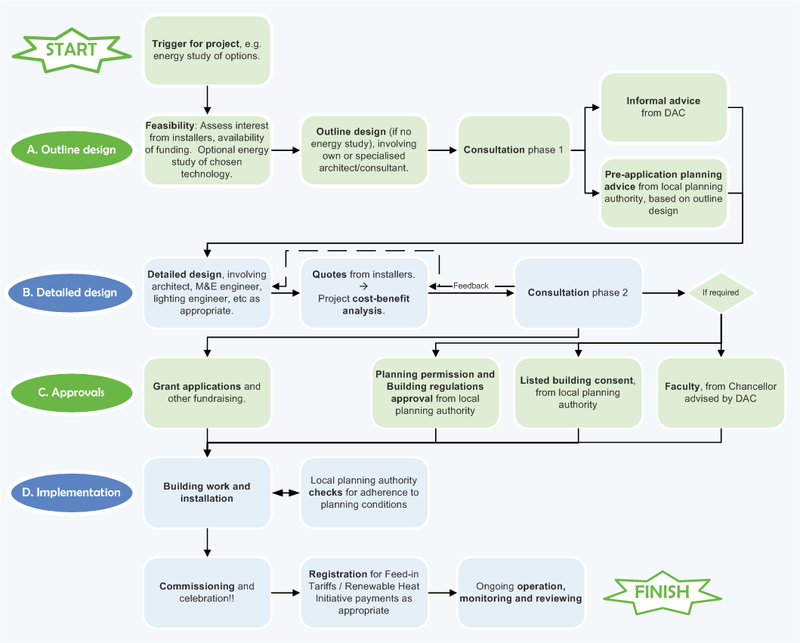 It is a good idea to engage early with your Diocesan Advisory Committee for the Care of Churches (DAC) and your local planning authority, to see whether your plans would be acceptable in principle. Informal advice from DAC and pre-application planning advice from the local planning authority are not mandatory but strongly recommended. The DAC in particular should be able to provide general information on the issues they will be considering, and what permissions you are likely to need. Note that planning guidance on projects in conservation areas and on listed buildings has changed over time, and may be interpreted differently by different authorities. You may be able to argue your case by referring to precedence elsewhere – see for example our case studies. Celebrate your success! And please let us know, so we can publicise your case study on this website, and help others through the process.